A massive thank you to everyone who ran, walked, supported and helped out in yesterday's Run for Rosie. It was a very special day and I'm sure it made Rosie smile. Another massive thank you to all of you who have raised and donated money for Rosie's fund with ACE Africa. Since the fund started, 70 individual Just Giving Pages have been set up and yesterday the total smashed £40,000. That means a lot to the Dwyers but even more to the children of the Southend Academy in Northern Kenya. Following on from the success of last years run, we'll be "Running For Rosie" again this year. For Rosie and the children of Southend Academy,Kenya, we wish to continue supporting our art project. To date we have all raised over £33,500 which will fund the Art Teacher (Brenda), materials and the administration of the project for 4 years. If we can increase the total to £42,283, the project can run for 5 years . So............... if you feel inclined to walk /run/jog/crawl through a traffic free Central London on Sunday 11th July, 2010 , be with people who love Rosie, raise some money and then come back to Ealing for a barbie and beer or 2, please sign up HERE. 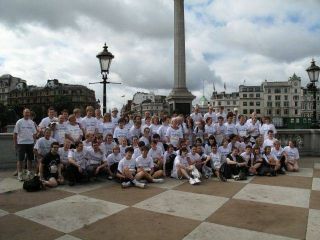 Click on LONDON 10K RUN 2009 to view photographs from last year's event. To access the pages, set up individually by the runners running for Rosie on the www.justgiving.com website, left click on this SPONSOR link and type in ROSIE DWYER in the “Sponsor a friend” field. 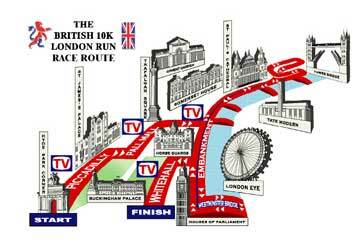 The Run will start at 9.35am from Hyde Park corner. The route takes you up Pall Mall, past Buckingham Palace and Trafalgar square up to St Pauls Cathedral and then on to Tower Bridge. Then it will take in the Tate Modern, the London Eye and the Houses of Parliament.